The best competitions are the ones you don't even have to enter but unlike the Spanish lottery, actually yields a result. Western Herd were running a competition on Facebook. I hadn't even liked their page at the time. My mate Brendan entered it though. It was pretty simple, you commented and tagged a friend and then both of you get a hamper of beer each. Brendan entered a number of times, adding different people each time. The entry with myself named actually won. Someone called it a fix, perhaps knowing who I was but that's silly. Breweries don't need to have a fake competition to send me beer, they just send it. Brendan contacted them to arrange the prize. The PR girl behind it had no idea who I was but when he explained, she upped the game and dropped the pointless hamper basket bit and instead just organised two full cases minus a few beers to accommodate 2 glasses in each box. 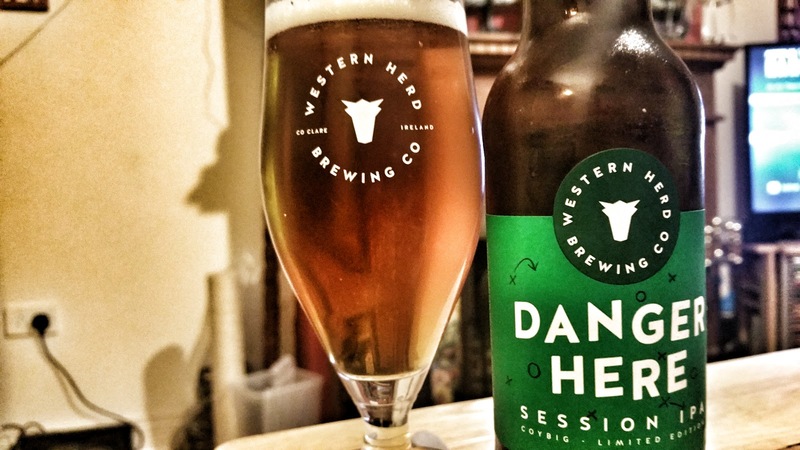 The first one is a 4.8% session IPA called Danger Here. It's a tip of the hat to the Irish football team. COYBIG is Come On You Boys In Green. Other than that, there's nothing footbally about it. It's pretty fruity but also packs a floral, perfume type soapy thing that I don't like. It tends to come in the form of lavender and to me it's slightly unpleasant but plenty of people like that sort of thing. It's pretty bitter too. My other problem is that to me, anything above 4.3% is just not a session beer, it's a normal strength beer. I would have liked to have seen this brewed to 3.8% instead. It was pleasant enough but not their best effort. 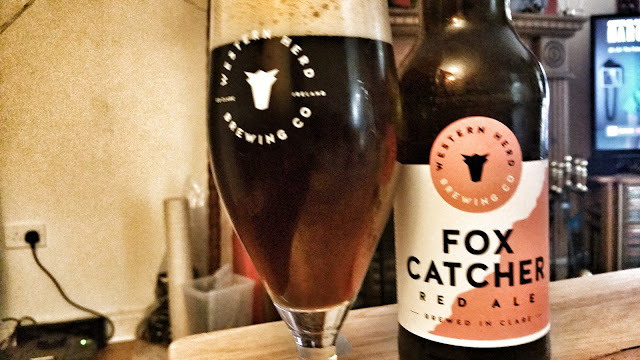 Fox Catcher is their almost obligatory red ale though at 5.3% it's bigger than most. Thankfully, they haven't gone the traditional Irish route and instead it's closer to a red IPA. It's packed full of citrus and has a pervasive bitterness but there's a big sweet caramel and burnt toast malt body there to balance it. This one grew on me. Apologies for the slightly fizzy picture on this one. Siege is their 5.1% pale ale. I found it slightly tart and sour, something I liked in this beer but I'm not sure if it's supposed to be that way. I'll have to try another bottle to check. It's bitter but not overly so. There's a lot of lemon and orange citrus. I liked it. 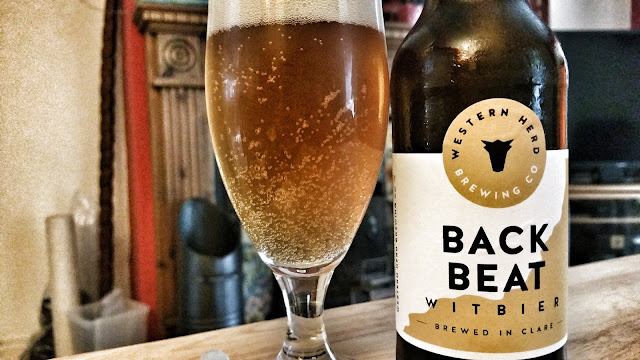 Back Beat is a 5% witbier. 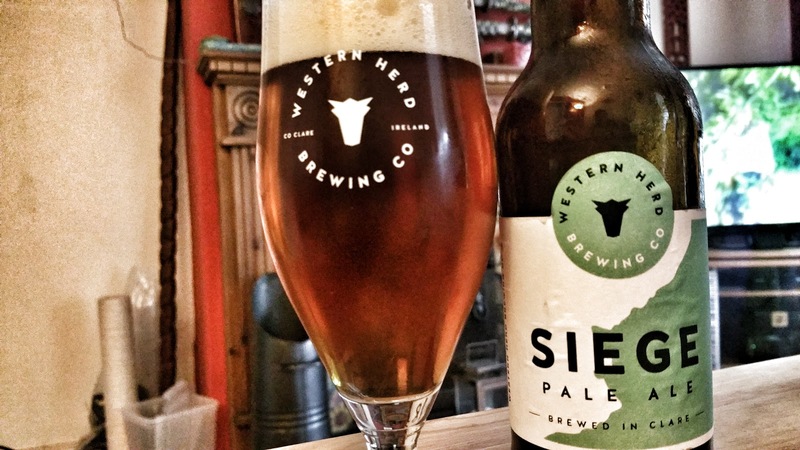 It's actually like a cross between a German Hefeweizen and a Belgian witbier with a bit of IPA thrown in. Standard wit notes like spicy coriander and orange peel but there's also banana like a weissbier and it's rather bitter. It's interesting and refreshing. Perfect in the summer sun. 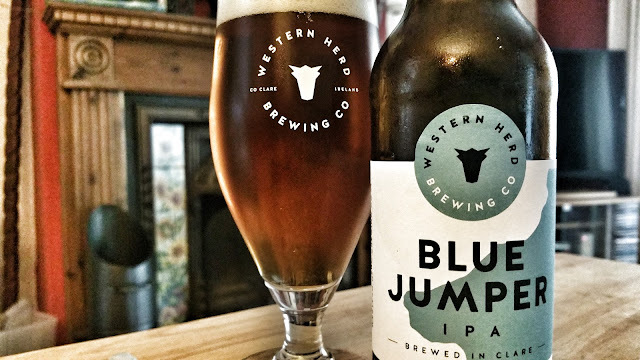 An lastly we have Blue Jumper which is a 6.2% IPA and probably my favourite of the range. It has that big caramel chewy body that I love in an IPA with a thick bitter pithy orange thing going on. It's not complex, just very well made. And there we have it, the whole herd accounted for. I like the labelling and their logo. I can't be sure but each bottle has a different design and it looks like it could be the Clare coastline. Then again, they might just be ink blots.